one of the best programs so far! They have an interesting trading system that can be best described as a mix between fundamental trading, news trading and common sense trading. 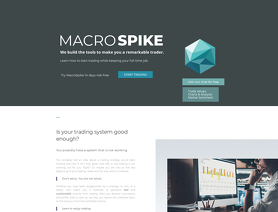 can highly recommend the macrotrader platform which is sth like a trade manager with a news feed for trading news with multiple brokers. I would say they are somewhere in between the retail and professional space.